As many as 40 whiskies, each aged for 12 years or more, make up the classic dram that is Johnnie Walker Black Label. This is a smooth, silky blended Scotch that has great depth and power; a metaphorical velvet fist in a velvet glove. There's a lovely balance of raisin fruit and smoky notes on the finish. A deluxe whisky setting the benchmark for all others. 'Everest of deluxe whiskies' by Jim Murray, author of The Whisky Bible. Perfectly defined hints of rich vanilla, dried fruits and smoky sophistication. Enjoyed over ice, with water or as a long drink with a splash of ginger ale. A blend of more than 30 mature whiskies from around Scotland. The gift to give since 1820. The iconic blend of over 30 malt and grain whiskies from around Scotland makes Johnnie Walker Black Label one of the world's best-selling blended Scotch whiskies. Loved by royalty, the whisky helped John Walker & Sons secure a Royal Warrant, which it still holds today. Johnnie Walker Black Label is considered to be the "the Everest of deluxe whiskies" and holds many awards worldwide. Full of dark fruits, sweet vanilla and signature smokiness, the blend of mature whiskies over 12 years old dances on your tongue. You can taste the rich, complex art of the blender to produce a well-rounded, big-flavour whisky. Serve on the rocks or as a long drink with a splash of ginger ale. 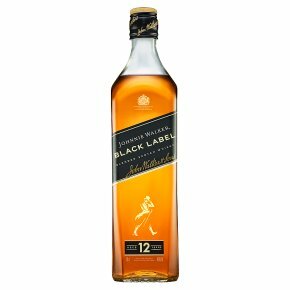 An outstanding whisky, Johnnie Walker Black Label can be appreciated at home when entertaining friends or family and will certainly be well-received as a gift for that special occasion.